Featured image: Roland Jones (far left) with the Paxton High School marching band. Photo courtesy of Eugene Holsey. 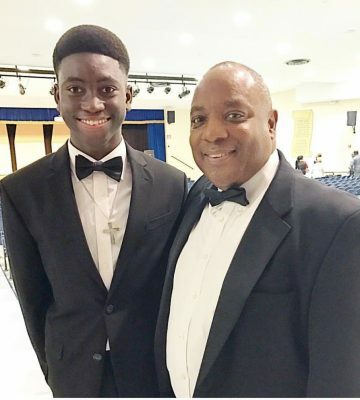 Roland Jones of Paxon High School is devoted to the things he loves, especially music and his students. 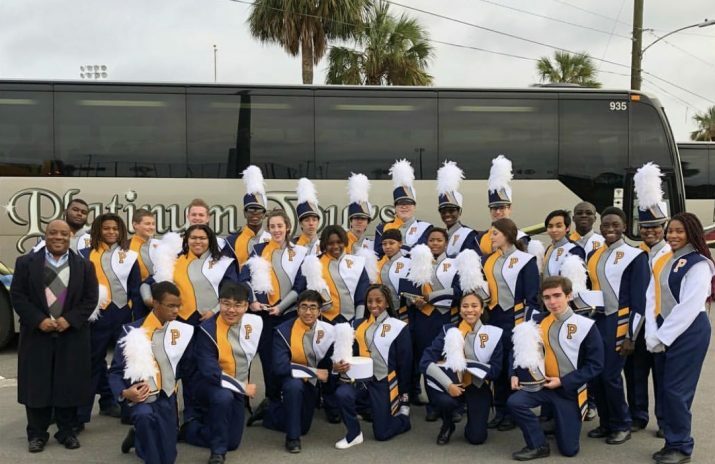 His teaching has made a notable impact on Paxon’s band, allowing it to perform at the SEC TaxSlayer Bowl and receive a multitude of invitations to perform on national television. His teaching style is unlike any I’ve experienced before. Last year I joined Paxon’s marching band, and I struggled in the beginning. When Jones noticed this, he immediately assessed the situation and started working with me one-on-one. He told me he wouldn’t stop helping me until I felt comfortable with the music. Jones not only advanced my playing abilities, but he also strengthened my confidence level. As an educator, Jones has also had a profound effect on the entire band at Paxon: He allows students to teach other students. Jones knows that gaining leadership experience as young adults will benefit us greatly in the future. When students get onto the podium to teach and conduct the band, he reminds us to be mindful of the things we are learning, since they will influence our future endeavors. He has a great connection with all of his students, empowering each and every one of us and reminding us daily not to give up and to keep trying. Jones incorporates life skills and financial literacy into band instruction without hindering his lesson plans or the curriculum. He allows students to help him manage the band’s bank account and teaches us the importance of the fund-raising correctly. This past marching season, Jones informed us about a financial challenge the band was facing. We were given an ultimatum by Paxon’s athletics director. We had to choose a financial plan that would give us the ability to grow as a band. Jones with student Eugene Holsey (left). Photo courtesy of Holsey. For several days we met as a team and brainstormed all of the possible ideas. Thanks to Jones, we learned new financial terms and how much to charge people for our performances so we could break even. We even met the bookkeeper as a group to learn more about our band’s financial details. Jones didn’t have to let his students in on the financial aspects of the band, but as a man who goes to great lengths to teach his students more about life as well as music, this highlights why Jones is a worthy recipient of CentSai’s Educator of the Month spotlight. Roland Jones Brings Financial Literacy Alive at Paxon High School?